We've got reason to celebrate: Today is the 3rd birthday of Anja's Food 4 Thought. I remember my daughter's third birthday. It was the date when she suddenly was not a baby anymore. She could talk, voice her opinion, and got herself a place in the kids neighborhood. With my blog, I kind of feel the same. It's getting more sophisticated, more demanding. The days, where I quickly post another cake or salad recipe, are over. I often feel I've done them all and I don't want to repeat myself. After posting 355 recipes (as this is what I have done in the past 3 years), I feel more obliged to justify another cake or salad recipe. It needs to be different. Another angle of looking at food. Another criteria to improve nutrition. 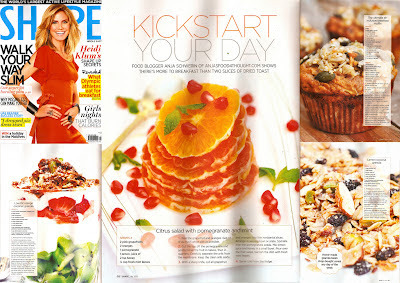 And, of course, it needs a pretty picture, to convince you readers that healthy food doesn't have to be boring. Now back to my little blog. 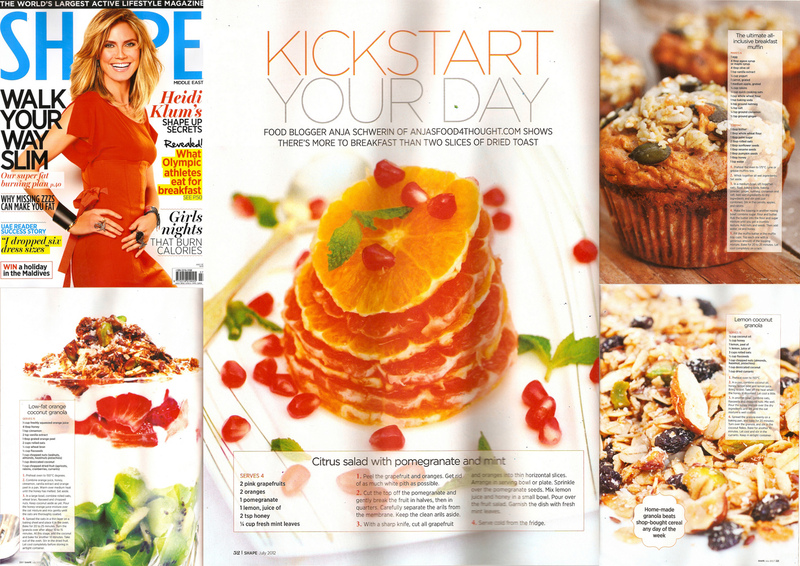 Over the years, many disasters have struck my kitchen while trying to "healthify" traditional recipes. Today's Pavlova is no exception. Good I remembered this year's blog's birthday a week in advance, so I had time to get it right. Let me tell you so much: I wasn't very hopeful after the second trial went straight into the bin. I herewith apologize to the all the chickens, whose eggs I have wasted in the past week. Some things, especially sweet things cannot be messed with. I sometimes get blinded by pretty pictures. More than once, a recipe that came with a mouthwatering picture didn't work. 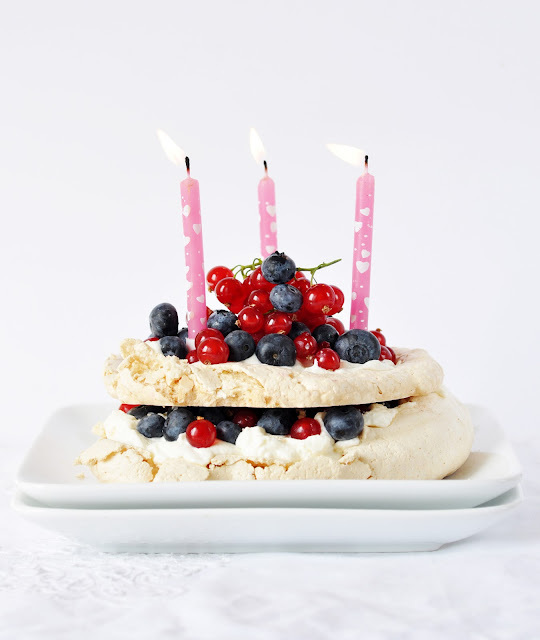 As for the Pavlova, forget about putting stevia in there, or jaggery, or a honey mixture. The texture or taste will not be the same. You'll get horribly tasting cardboard, but no pavlova. 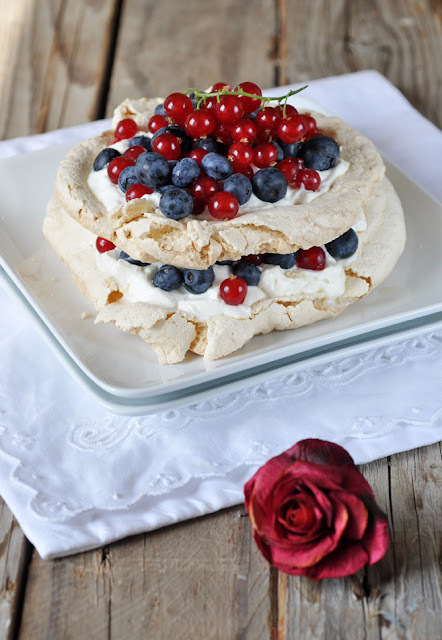 And while we are at it, Pavlova also doesn't need cornstarch, vinegar, arrowroot, etc. A Pavlova is egg whites and sugar. In the right proportion. NOTHING ELSE. Now to make it justifiable for this healthy food blog of mine, I used raw turbinado sugar. Copious amounts of it, I admit, to get the right proportion between egg whites and sugar. But hey, you are not supposed to eat the whole thing by yourself and in one go, right? I am so glad I got this right. If you master the art of making meringues, it's the easiest and finest dessert on the planet, with as little as four ingredients. Enjoy! Preheat oven to 150C. Line baking sheet with parchment paper. In an electric coffee of spice grinder, pulse the turbinado sugar a few times until it reaches the texture of caster sugar. Set aside. In a very clean bowl, whisk the egg whites with an electric mixer on low for a couple of minutes, until bubbly. Increase the speed to medium for another minute, then whisk the high speed until stiff peaks are formed. Now whisk in the sugar at high speed, one tablespoon at a time, until the mixture is stiff and glossy. Spoon the stiff egg white mixture in two round circles of about 8 inch/20cm onto the prepared baking sheet. Level the top to an even surface. Put them into the oven, reduce the heat immediately to 140C, and bake for about 50-55 minutes. The meringues should be then crisp and dry to the touch, but not yet browned. Switch off the oven and leave the meringues in the oven until it has completely cooled, preferably over night. The meringues can be made several days in advance. Keep them in an airtight container in the fridge until needed. Just before serving, whip the cream with an electric mixer until it hold soft peaks. Spoon a generous layer of whipped cream onto each meringue and top it generously with fresh berries. Layer the filled meringues on top of each other. Cut into wedges and serve.